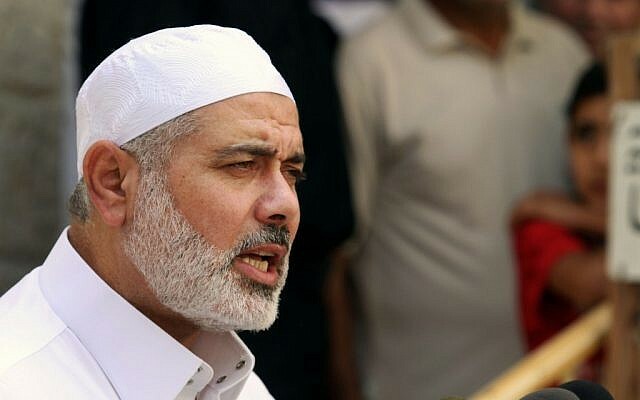 JERUSALEM — Israel said Tuesday it allowed the mother-in-law of Hamas leader Ismail Haniyeh into the country for medical treatment. Maj. Guy Inbar, an Israeli spokesman, said the 68-year-old woman was allowed to enter from the Gaza Strip on Monday to receive cancer treatment at a Jerusalem hospital. A relative in Gaza confirmed she was in Israel, with Israel Radio reporting she was being treated at the Augusta Victoria Hospital in East Jerusalem, by the Mount of Olives. The announcement followed Haniyeh’s resignation as prime minister Monday, and the formation of a new Palestinian unity government. Hamas has ruled Gaza the past seven years. While Israel considers Hamas a terrorist group, Gaza residents — even those with ties to Hamas — are authorized to cross the border on a humanitarian basis. Last November, Haniyeh’s granddaughter received treatment in Israel for an infection in her digestive tract. She later died in Gaza.